Also known as hako-zushi, box sushi, is a pressed sushi from the Kansai region, a favorite and specialty of Osaka. A block-shaped piece is formed using a wooden mold, called an oshibako. The chef lines the bottom of the oshibako with the toppings, covers them with sushi rice, and then presses the lid of the mold down to create a compact, rectilinear block. The block is removed from the mold and then cut into bite-sized pieces. Consists of an oblong mound of sushi rice that the chef presses into a small rectangular box between the palms of the hands, usually with a bit of wasabi, and a topping (the neta) draped over it. Neta are typically fish such as salmon, tuna or other seafood. Certain toppings are typically bound to the rice with a thin strip of nori, most commonly octopus (tako), freshwater eel (unagi), sea eel (anago), squid (ika), and sweet egg (tamago). Also known as hako-zushi, box sushi, is a pressed sushi from the Kansai region, a favorite and specialty of Osaka. A block-shaped piece is formed using a wooden mold, called an oshibako. The chef lines the bottom of the oshibako with the toppings, covers them with sushi rice, and then presses the lid of the mold down to create a compact, rectilinear block. The block is removed from the mold and then cut into bite-sized pieces. Particularly famous is battera, pressed mackerel sushi. Makizushi "rolled sushi" Norimaki "Nori roll" or Makimono, "variety of rolls" is a cylindrical piece, formed with the help of a bamboo mat known as a makisu. Makizushi is generally wrapped in nori (seaweed), but is occasionally wrapped in a thin omelette, soy paper, cucumber, or shiso (perilla) leaves. 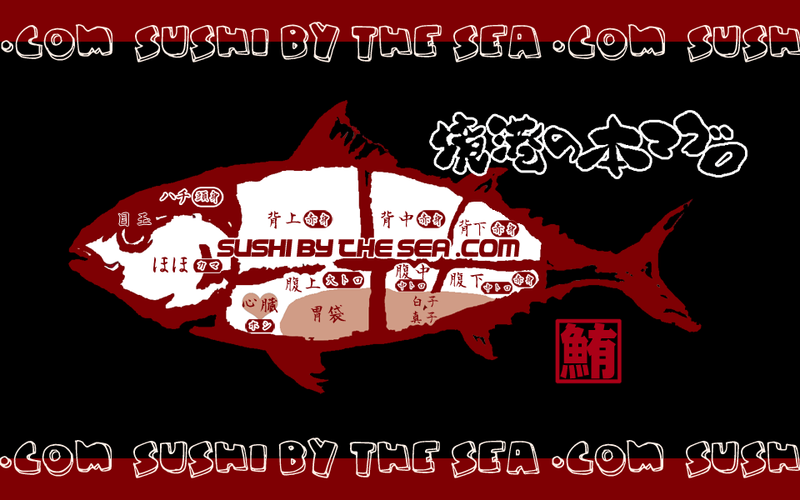 Makizushi is usually cut into six or eight pieces, which constitutes a single roll order. 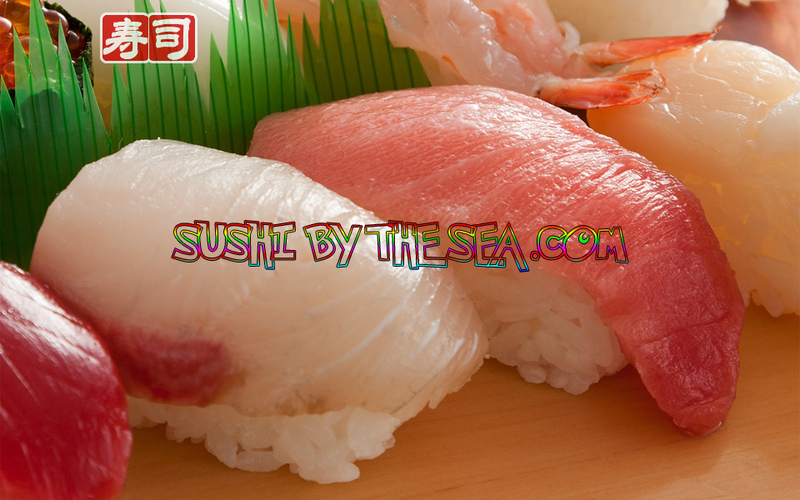 Below are some common types of makizushi, but many other kinds exist. Sushi Restaurant consists of an oblong mound of sushi rice that the chef presses into a small rectangular box between the palms of the hands, usually with a bit of wasabi, and a topping (neta) draped over it. Neta are typically fish such as salmon, tuna or other seafood. 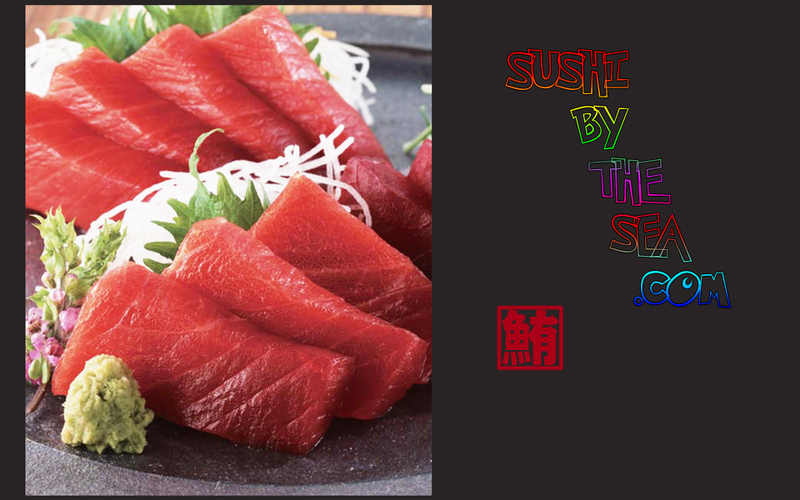 Copyright © 2018 SUSHI BY THE SEA Webmasters. All rights reserved.